a transparent, usually slightly yellow, often opalescent liquid found within the lymphatic vessels, and collected from tissues in all parts of the body and returned to the blood via the lymphatic system. It is about 95 per cent water; the remainder consists of plasma proteins and other chemical substances contained in the blood plasma, but in slightly smaller percentage than in plasma. Its cellular component consists chiefly of lymphocytes. The body contains three main kinds of fluid: blood, tissue fluid, and lymph. The blood consists of the blood cells and platelets, the plasma, or fluid portion, and a variety of chemical substances dissolved in the plasma. When the plasma, without its solid particles and some of its dissolved substances, seeps through the capillary walls and circulates among the body tissues, it is known as tissue fluid. When this fluid is drained from the tissues and collected by the lymphatic system, it is called lymph. 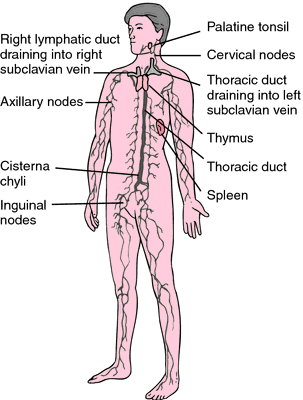 The lymphatic system eventually returns the lymph to the blood, where it again becomes plasma. This movement of fluid through the body is described under circulatory system. lymph node any of the accumulations of lymphoid tissue organized as definite lymphoid organs along the course of lymphatic vessels (see accompanying illustration); they consist of an outer cortical and an inner medullary part. Lymph nodes are the main source of lymphocytes of the peripheral blood and, as part of the reticuloendothelial system, serve as a defense mechanism by removing noxious agents such as bacteria and toxins, and probably play a role in antibody formation. Sometimes called, incorrectly, lymph gland. Called also lymph or lymphatic follicle and lymphatic nodule. Location of clusters of superficial lymph nodes. From Applegate, 2000. One of numerous round, oval, or bean-shaped bodies located along the course of lymphatic vessels, varying greatly in size (1-25 mm in diameter) and usually presenting a depressed area, the hilum, on one side through which blood vessels enter and efferent lymphatic vessels emerge. The structure consists of a fibrous capsule and internal trabeculae supporting lymphoid tissue and lymph sinuses; lymphoid tissue is arranged in nodules in the cortex and cords in the medulla of a node, with afferent vessels entering at many points of the periphery. /lym·pho·glan·du·la/ (lim″fo-glan´du-lah) pl. lymphoglan´dulae a lymph node. One of numerous round, oval, or bean-shaped bodies located along the course of lymphatic vessels, varying greatly in size (1-25 mm in diameter) and usually presenting a depressed area, the hilum, on one side through which afferent lymphatic vessels enter and efferent lymphatic vessels emerge. The structure consists of a fibrous capsule and internal trabeculae supporting lymphoid tissue and lymph sinuses; lymphoid tissue is arranged in nodules in the cortex and cords in the medulla of a node, with afferent vessels entering at many points of the periphery. 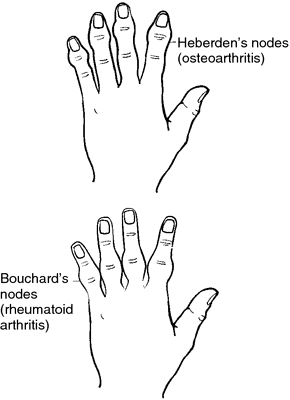 Synonym(s): nodus lymphaticus [TA] , nodus lymphoideus [TA] , lymph gland, lymphoglandula, lymphonodus. pl. lymphoglandulae [L.] a lymph node.